25 million p-values, visualized. 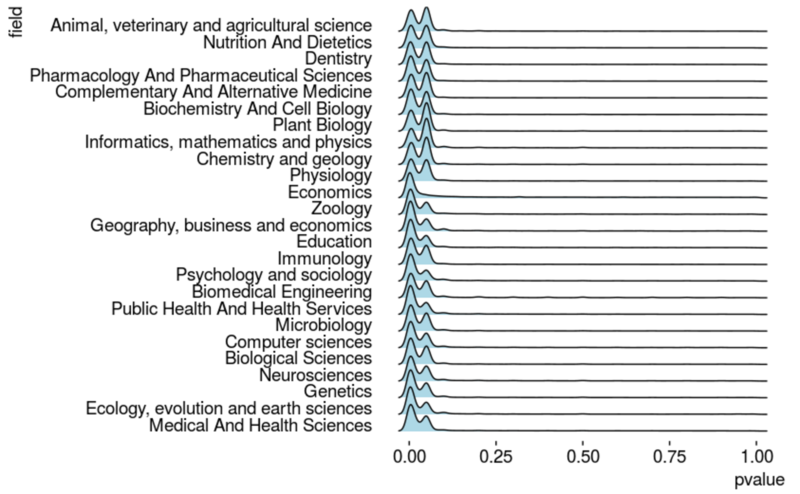 From the page of tidypvals, a new R package that combines data from different meta-analyses of p-values across disciplines. What a week! While being glued to the news, we managed to find a lot of stories not about Senate rules and the politics of healthcare. We hope you enjoy them as you try to unwind. Philip Cohen has a post up on his blog about how we can use ASA paper awards to push sociology towards open access, and specifically towards SocArXiv. Go read it to find out more about the initiative – and specifically, to find good sample award text that your section could easily modify and implement. The original SocArXiv announcement is here, including details on how SocArXiv will provide up to $400 towards an award winner’s travel if your section opens up the award. In addition to encouraging every section to seriously consider this proposal, I want to suggest two alternative ways that sections can promote open access if, for some reason, the SocArXiv plan is not acceptable. In honor of San Diego Comic-Con, this chart comes from Amanda Shendruk’s excellent analysis of gender in comic books. Shendruk finds that women have fewer physical powers and more mental and emotional ones, and that (as this chart shows) when women superheroes are on teams, they are either a small fraction of a team (less than a third) or part of all women teams. The following is a guest post by Jeff Lockhart. Recently, Cindi May argued in Scientific American that “Students are Better Off without a Laptop in the Classroom.” As with the numerous articles in this vein that preceded it, May’s article was picked up by many academics on social media as proof that they were right to ban laptops in their classrooms. Others have responded that students have always found ways to distract themselves, that banning laptops is infantilizing and that it’s harmful to students with disabilities, among other objections. Although these are important concerns, I want to focus here on a few frustrating trends in the research and reporting on classroom laptop use. Pew reports on a big shift in Republicans’ views towards colleges. More coverage here. 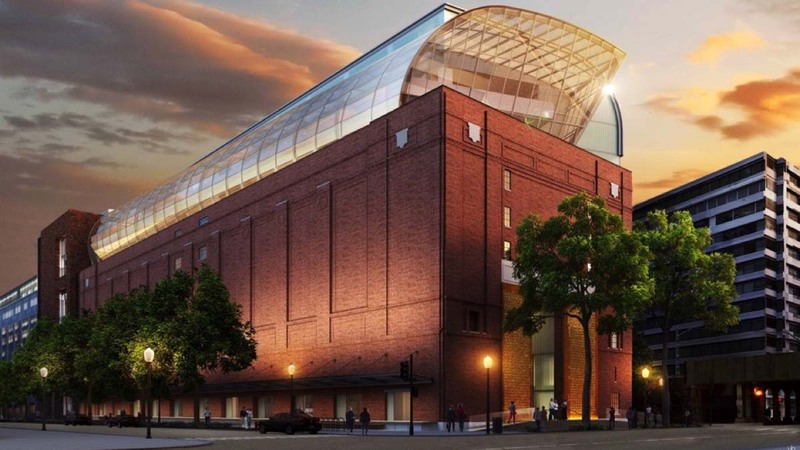 An artist’s sketch of the Museum of the Bible, currently under construction. Source. The following is a guest post by Fiona Greenland. Last week’s news that Oklahoma-based Hobby Lobby faced civil forfeiture for illegally importing Iraqi antiquities came as no surprise to cultural property experts. The company had been under scrutiny since 2015, when news of the investigation broke. And even before the investigation, scholars, including Roberta Mazza, an ancient historian at the University of Manchester, identified inconsistencies in the provenance histories, or ownership records, of antiquities obtained for Hobby Lobby-backed Museum of the Bible. Equally unsurprising in the wake of the forfeiture announcement were the muddled claims about Hobby Lobby funding ISIS. The forfeited antiquities at the heart of the civil complaint were shipped in late 2010 and early 2011 – prior to the period when ISIS is known to have been associated with archaeological looting in Syria and Iraq. Joel Baden and Candida Moss, two theologians who have closely studied the MoB and Hobby Lobby, rejected the connection in their New York Times editorial on July 6. But the HL-ISIS meme persists, with the frustrating result that the everyday illegal practices of the global antiquities market are overshadowed by ISIS drama. A lot has been written about Hobby Lobby’s dodgy antiquities deal, and I will defer to the legal experts for analysis of the civil complaint (check out Rick St. Hilaire’s blog). There is good reason to care about this story. The illicit removal of artifacts from archaeological sites destroys information about the objects’ context and history, can damage the artifacts, and is linked with other forms of criminal activity. This is true not just in the Middle East but all over the world. Equally worrisome is the possibility that when a big firm like Hobby Lobby spends big money on antiquities, looters are encouraged to keep digging and dealers are emboldened to sell objects that shouldn’t be on the market in the first place. Those are real problems and yet what I want to focus on here is the rest of the iceberg. Hobby Lobby’s buying power is setting ancient historical studies on a new axis. 636, rue Cathcart, Montreal, about one kilometer from the Palais des Congrès.